A preliminary review of the San Diego Police Department's year-old "body camera" program suggests that the uniform-mounted devices can help reduce officers' use of force in the field and simultaneously lessen citizens' accusations of misconduct against them, SDPD Chief Shelley Zimmerman said Wednesday. 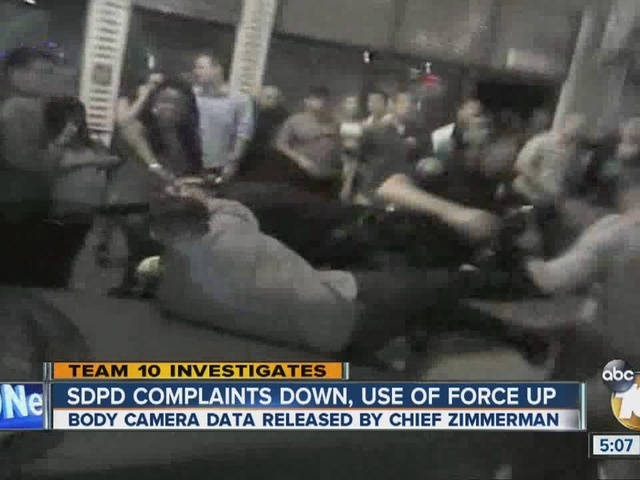 Deployment of the audio-video recorders apparently contributed to an 8 percent drop in "greater controlling force" used by officers in three of the SDPD's nine geographic divisions over the 12 months beginning in July of 2014, as contrasted with the comparable period the previous year, the chief told news crews during an afternoon briefing. Misconduct allegations against police personnel over the same time span decreased by 44 percent, further indicating that the cameras often serve to prevent or defuse tensions that inevitably arise between officers and those they contact in the course of their duties, according to Zimmerman. Though not definitive, the findings -- based on data gathered in the department's Central, Mid-City and Southeastern divisions -- support department officials' belief that the devices are a "win-win" for police and the public alike, Zimmerman said. "Anytime we can de-escalate a volatile situation and minimize the force necessary to gain compliance, it is safer for everyone involved -- our officers and our community," the chief told reporters at downtown SDPD headquarters. While officers' use of "greater" force dropped during the studied period, instances of less intensive compliance tactics -- such as guiding an uncooperative suspect's hands behind his or her back for handcuffing purposes -- increased by 17 percent, possibly as a direct result, according to the department's analysis. So far, a total of 871 of the department's roughly 1,850 sworn personnel have worn the cameras on a daily basis, according to Zimmerman. The remainder are expected to begin using them "fairly soon," she said. The city allocated about $4 million to fund the program, the chief told news crews.